After a physical therapy session this morning I had some time to kill, so I dropped by a nursing home to see my old friend Jerry. I checked his room and he wasn’t there. I went out to the court yard, two or three times before I found him there asleep soaking up sun rays. But not this time. After leaving the court yard I glanced in the dining room and there he was sitting in the middle of about five or six elderly women. I waved at him through the window and he motioned for me to come on in the room, which I did. He squirmed around and offered me a seat next to him. I sat down. Standing up at a portable bar-like contraption on wheels was a lady with several hot drink containers. I think she worked in the dining room. She asked me; with an Caribbean accent would I prefer coffee or tea. I told her coffee, “Thank you”. She first poured a tea to a lady then before pouring my coffee she asked me did I want decaf or regular. “Regular” I replied. Then she asked how many sugars and did I want cream. I thanked her and said just plain coffee. She poured it for me and then with tongs went around and gave each person newly arrived a napkin. She asked Jerry where his napkin was, because she already gave him one. Before he could find it she gave him another one. Then he found it but looked like, “what do I do with it now?” l Next the dining room lady with the tongs handed each person two warm chocolate chip cookies. Man! Warm chocolate chip cookies! The chocolate chips had melted, which complemented the cookies… yum! 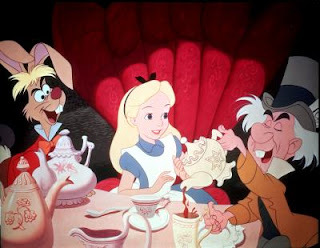 I think I crashed a tea party and the warm chocolate chip cookies were a substitute for scones. It was a yummy substitute. I was thinking about giving her the “thumb up” sign, but thought at her age that might have a completely different meaning. Jerry motioned for us to go back to his room, which we did. He was having a lopsided time trying to move his wheelchair with one hand because he had the two chocolate cookies in the other. I helped him. I already gobbled down my chocolate chip cookies (eat them while they are hot!) but was still drinking my coffee. Between both us we had two good hands to power the wheelchair, which worked. That reminds me of a mock want-ad I saw one time in MAD magazine. It went something like this: Short right leg man seeking short left leg woman. Object: Mambo ballroom dancing. We went back to Jerry’s room with me only spilling one little splash of coffee in the corridor. There, Jerry showed me his latest poster. He has a picture of himself on the poster and underneath his picture is his name and his date of birth. ; A date in 1944. He motioned for me to do the same, write my name and birth date, which I did, according to his instructions I left enough space for a picture of me to fit in. Also on the poster he has several articles about “Big Jim” Bagby. One of the old yellowed newspaper clip said Big Jim was on a hitting streak and might break Joe DiMaggio’s record. Big Jim Bagby was the father of a classmate of mine Charles Bagby. I think they moved to Marietta in the late 40s or early 50s. The Bagby family lived near Jerry’s family in the Park Street area in Marietta. After a while I looked at my watch and said I had to go, I had an important date* and mustn’t be late. We bided each other farewell, and I left. *I thought it was about time for Cajun John’s to open for the noon crowd. I was wrong. I wanted to try their shrimp poboy I heard so much about.